Jenkins is a very popular Continuous Integration tool these days and using it with PHP project is became so easy with help of Jenkins-PHP template project. This project gives us ultimate guide to get started with basic setup of the PHP related tools and Jenkins plugins. Here are some more useful plug-ins like phing, Ruby, RVM, PHP and Rake. You can install and restart Jenkins. 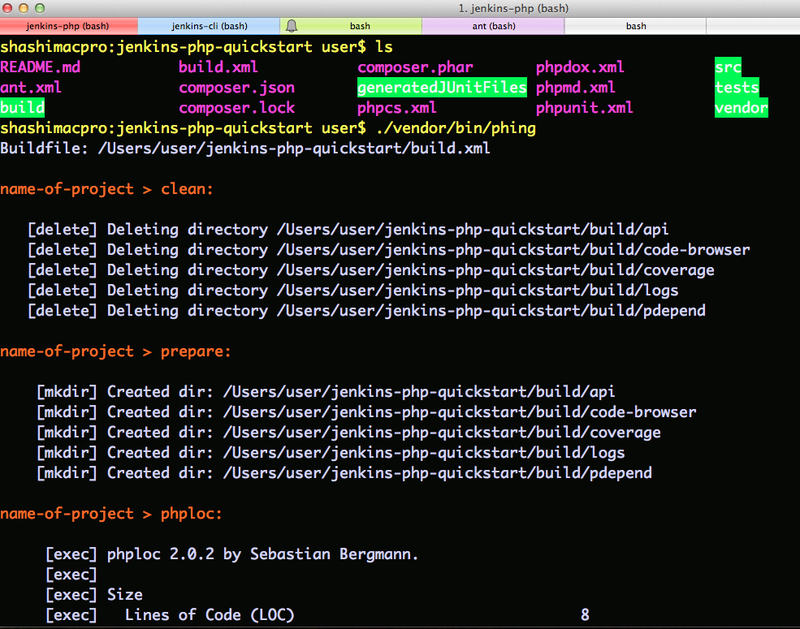 Composer is a great dependency management tools for PHP. We can take benefit of Composer in order to install all PHP related dependencies locally or globally, choice is yours. Let’s create composer.json file with all Jenkins-PHP dependencies. 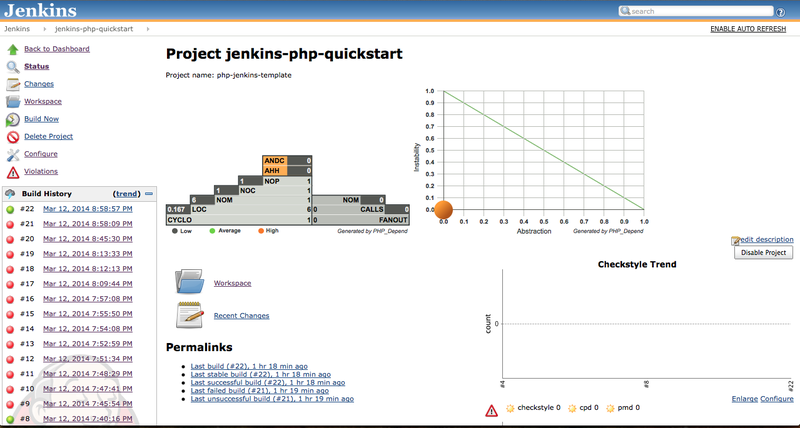 I found an awesome template project on GitHub ‘Jenkins-php-quickstart‘ and forked it immediately. This project has all the required files to generate necessary reports. Here is how I installed this project. This will run all phing tasks and generate necessary reports. 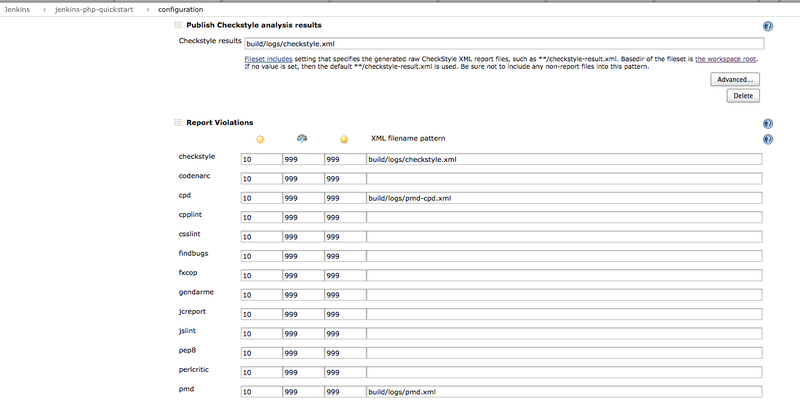 There is file called ‘checkstyle.xml’ in the ‘build/logs’ directory which displays checktyle reports for the existing project. Two file ‘jdepend.xml’ and ‘junit.xml’ in the ‘build/logs’ directory which displays Junit style reports for the unit tests. There are two file called ‘pmd-cpd.xml’ and ‘pmd.xml’ to detect smell in the PHP code in the ‘build/logs’ directory. Pdepend file are .svg file to plot a graph of the code analysis. Now, we are done. Click on ‘Save” and “Build Now” to build this project. Once we build the project. We got following nice looking reports on the project home page. 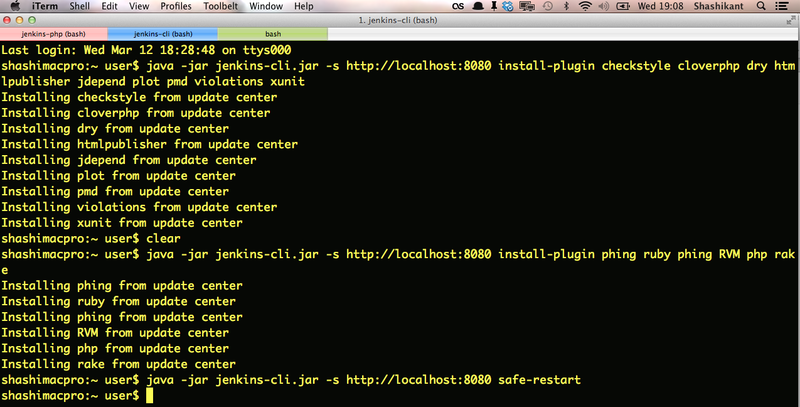 This will help to access all those build dependencies across various Jenkins jobs. This will save lot of time as we are not downloading dependencies all the time.